It’s morning, you’re hungry, and you’ve got a little extra time on your hands because maybe it’s the weekend. What do you do? You made thick and fluffy chocolate studded pancakes of course! Are there any other options?! I mean, yes. Of course there are. 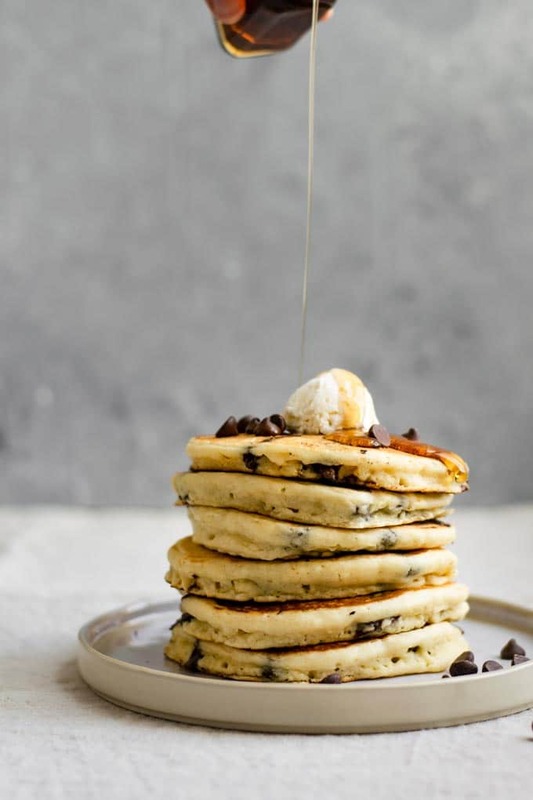 And me, I’m usually team blueberry pancake all the way, but last week the cravings for chocolate chip pancakes hit me hard and I had to indulge them. I wanted to make diner style, soft and fluffy American pancakes. Buttery and begging to be drenched (in moderation of course!) in maple syrup. I’ve mentioned previously that I grew up with these whole grain cornmeal pancakes, and I love those pancakes! They are soft and fluffy too, and super flavorful from the mixture of whole grains. But sometimes you don’t want 100% whole grain pancakes, and bisquick style pancakes are in order! And that’s ok. I’ve got your back with this recipe! 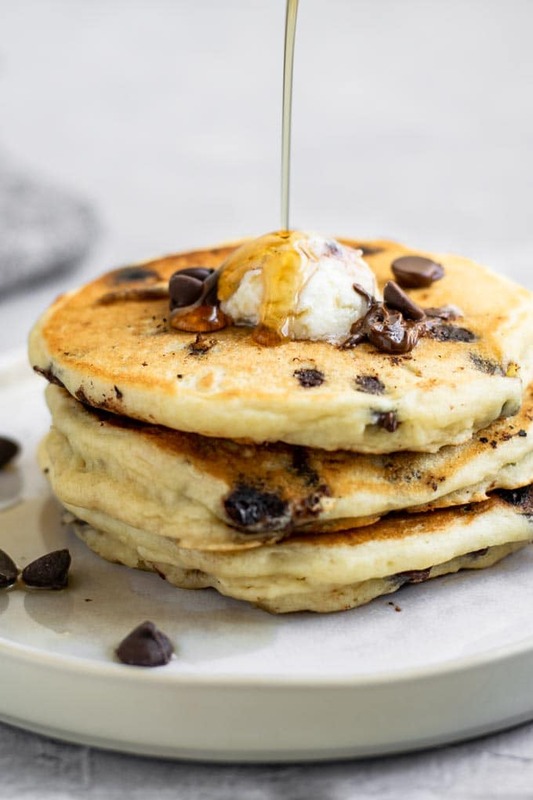 This recipe is no fuss and you’ll be enjoying chocolate chip pancakes in no time! First make the pancake mix. Whisk together the dry ingredients, then add the wet and mix until it just comes together. Add the chocolate chips then mix until they’re distributed and the batter is relatively smooth with a few lumps. When it comes to pancake batter you don’t want to over mix, so don’t expect a completely smooth batter! This recipe make a thick but pourable batter. As with all my baking or flour-based recipes, how you measure is important. You can either use a scale to save yourself the trouble, or fluff your flour before scooping and leveling. Whisking the flour undos any settling that’s happened while your flour sits, and ensures that your cup is pretty similar to mine and from day to day. Once you make the batter, let it rest for about 10 minutes. This rest time allows the gluten (protein in flour) to relax, so that your pancakes can rise to ideal fluffiness and be perfectly soft. Next, heat the pan or griddle and [vegan] butter it. 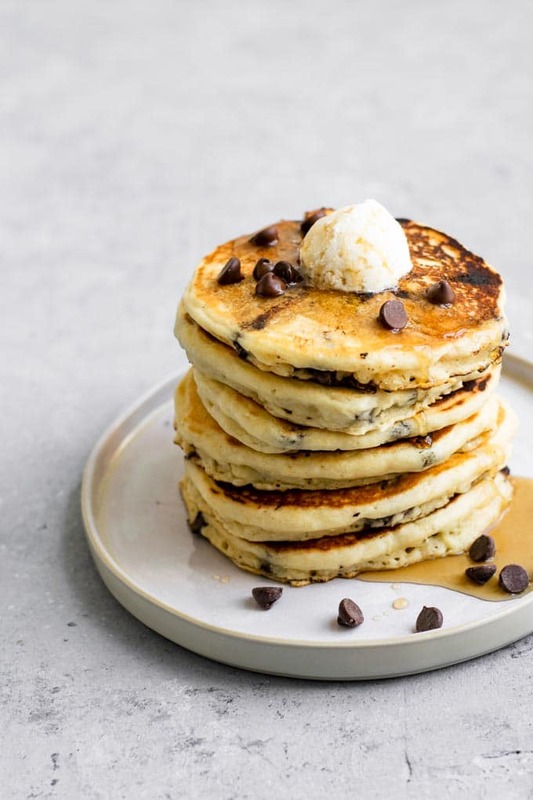 Whether you’re cooking your pancakes on a cast iron skillet, nonstick fry pan, or griddle, you’ll want to follow these same instructions. I like to cook my pancakes on my baking steel griddle because this allows me to make 3 of these pancakes at a time! Otherwise I’ll set up two skillets so I don’t have to wait long between pancakes. Heat the pan/griddle over a medium low heat. I like to start lower because it’s easier and quicker to increase the heat than lower it when you’re already cooking pancakes. Too high of a heat leads to the outsides cooking faster than the insides and uncooked pancake centers. This is particularly relevant with thick pancakes like these. Once the pan or griddle is hot, we add a little bit of fat. And I mean just a thin layer! We’re not trying to fry the pancakes, just keep them from sticking while also developing that gorgeous golden color and making them extra buttery tasting. My first choice with these pancakes is to use a vegan butter, if it’s in a stick form you can just rub the stick lightly over the pan or griddle to make a thin layer. Alternatively you can use a neutral flavored oil like canola or safflower. Pour a bit over the pan or griddle, then take some paper towel and rub it around to cover the surface. The paper towel absorbs extra oil and creates a thin even layer across the pan or griddle. Make sure to keep your fingers away from the hot surface while you do this. A spray of cooking oil also works really well to create a thin layer of oil over the pan or griddle. 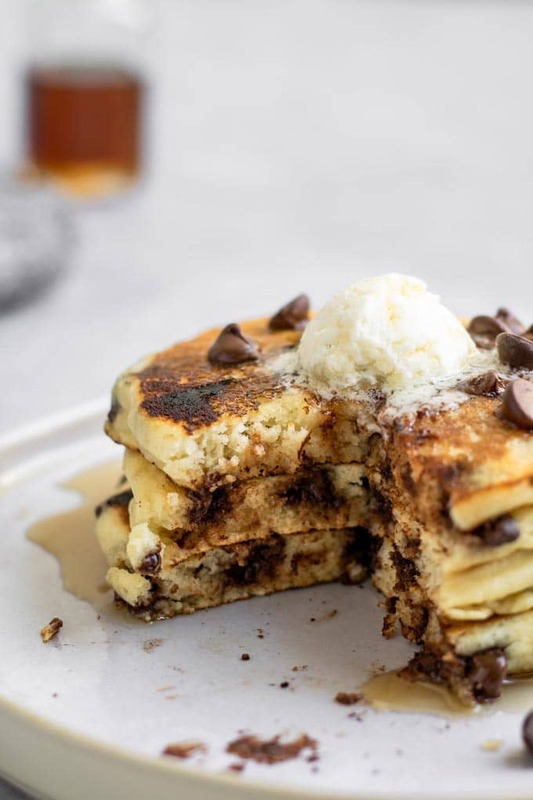 Once the pan is hot and lightly buttered, immediately pour in the chocolate chip pancake batter. I use a 1/3 cup measurement to make consistently sized ~6″ pancakes. You can make bigger or smaller pancakes as you prefer! Flip the pancakes once they’re golden on the bottoms. The batter will be a bit less wet looking, and you should be able to flip them easily with a thin spatula. This should take about 3 minutes. If you have the heat up too high the outsides will cook too quickly and leave you with uncooked pancake centers. So adjust the heat as needed to keep this from happening! The second side usually cooks a bit faster, and when it’s done it will also be golden brown. The batter will be fully dry (cooked) around the edges and through the center. Continue with making the rest of your pancakes, buttering or oiling the pan/griddle between each pancake. 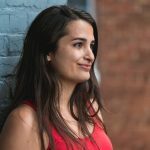 Serve these pancakes hot, with vegan butter (if you want) and all the maple syrup your heart desires! 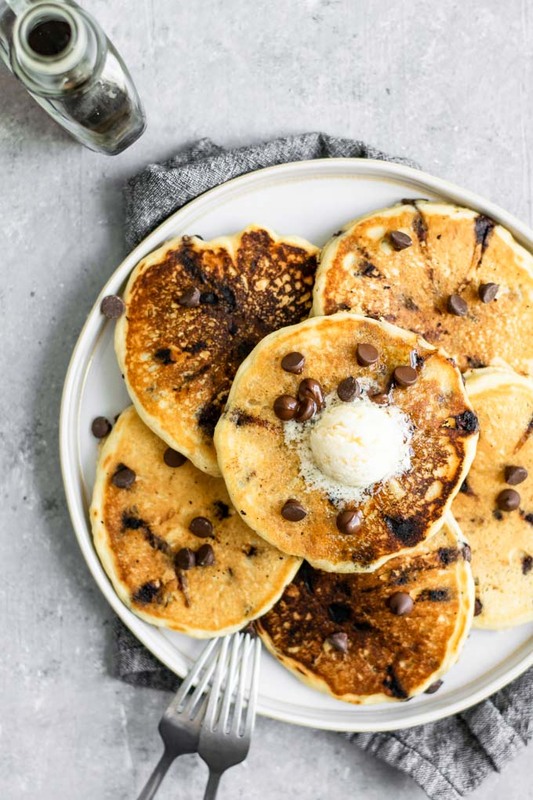 These are the chocolate chip pancakes of my dreams. I hope you enjoy them as much as I do! 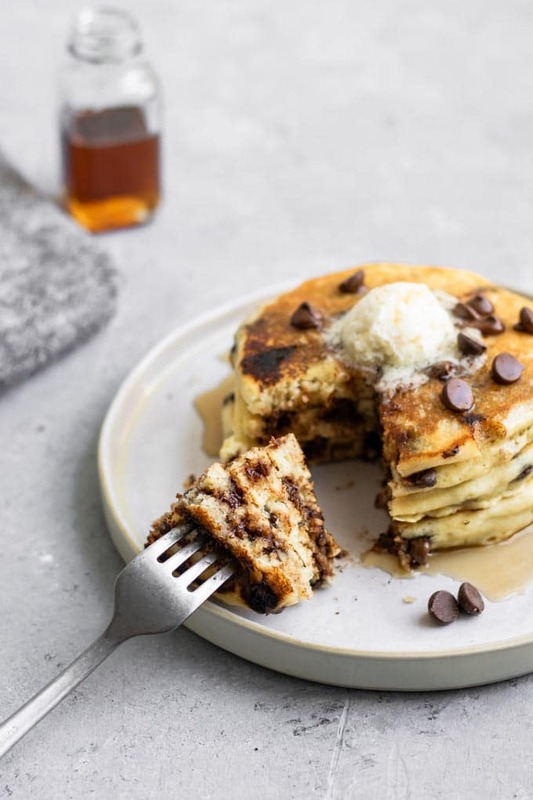 If you make these vegan chocolate chip pancakes, leave a comment below and rate the recipe on the recipe card. And please share your photos with me on Instagram, tag @thecuriouschickpea and #thecuriouschickpea. I love seeing your recreations! 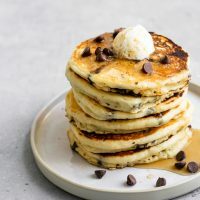 These fluffy vegan pancakes are stuffed with melty chocolate chips, they're quick and easy to make and the perfect breakfast or brunch! Mix the flour, sugar, cornstarch, baking powder, and salt together in a mixing bowl. Pour in the plant milk, melted vegan butter (or oil), and vanilla extract and mix until combined. Some lumps are ok, don't over mix! Fold in chocolate chips, then let the batter rest for 10 minutes. Heat a griddle or fry pan over medium low heat. When hot, melt a thin layer of vegan butter over the pan or griddle, or spray with a thin layer of oil. Pour 1/3 cup of batter for each pancake and let cook until the batter has risen a bit, looks drier (partially cooked) and the bottoms are golden. Slide a thin spatula under the pancake and flip. Cook the second side until it is golden and the batter in the middle cooks through. It should take 2-3 minutes for them to cook on each side, if it's cooking too fast the insides won't cook all the way through so lower the heat. Repeat with remaining pancakes, lightly buttering or oiling the pan or griddle between pancakes. Serve warm with maple syrup and some vegan butter (optional). A griddle makes the pancake cooking process a lot faster as you can make a few at a time, or try using 2 pans to speed things up. Recipe makes 6-7 6" pancakes.